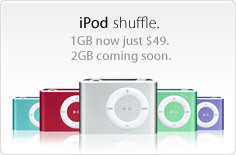 Today Apple announced a “new” 2GB iPod Shuffle for $69 and cut the price on the 1GB iPod Shuffle to a mere $49. I still don’t really want a shuffle (nor do I personally know anyone that has one), but I think that they might be reasonably priced now. Previous Post What Color Is Your Sound?